Patshyn Catrin: WIP Wednesday on Thursday. No wait a minute it's Friday now! WIP Wednesday on Thursday. No wait a minute it's Friday now! So I went back to work on Monday and I've already given up on keeping up with my blog reading and I haven't touched my sewing machine since Sunday afternoon. Work hasn't been too bad but trying to do everything that I already wasn't doing very well when I was home all day has proved to be near on impossible! Anyway I had hoped to post this on Wednesday but I haven't been near the laptop all week (I do my blog reading on my mobile) so here it is. We visited Cadi a whole week after she was born. Considering her parents and sisters visited us a few hours after we bought Marged home from hospital this was very tardy of us! Unsurprisingly I didn't manage to finish Cadi's quilt in time so I promised that they would receive something before the end of the month. The idea was to fussy cut the large flower and then fussy cut some of the petals and scatter them along the quilt as if they were being carried away by a gust of wind. I like it but I think that I should have added some more scattered petals. I've already made the binding out of the same cream background fabric but with a scrap of the Madrona Road for the corner opposite the large fussy cut flower but I still think that it's a little too bare. I had planned to use the same cream fabric (I have quite a bit of it) for the backing with just Cadi's name (made from scraps of the Madrona Road) appliquéd in the bottom left hand corner but since then I've acquired two vintage sheets that I think would fit the bill just right - what do you think? My husband thinks that this would make the quilt a little 'too blue' for a baby girl and although I don't think that a presant for a baby girl has to be pink I think that it would be a little 'too blue' full stop. So I was thinking of adding a little something to the quilt top. I don't like spending too much time with Mr Seam Ripper so instead of taking it apart to add more petals I thought that I'd appliqué some butterflies to the top. (As inspired by this wonderful quilt by Emma @ Sampaguita Quilts) I don't have that many scraps but I think that I've got enough pinks to add a splash of colour to the top. 1. Do I go with the cream backing as originally planned or do I go with one of the vintage sheets? 3. Should I add the butterflies to the quilt top or leave it as it is? I'd really value your opinion. And here's a list of my other WIPs in the order that I hope to finish them in. 1. Cara's quilt. Hand sewn half of the binding on. Hope to get the other half done on a road trip on Sunday. 2. Get shirty. Quilt front and back ready. Need to piece the batting (lqs only sell 45" wide 100% cotton batting!?!?!) and then baste. 3. House quilt. No Progress. 4. Anwen's quilt. No Progress. 5. Nephew's quilt. Still haven't started. Really should think about starting to cut! On Hold - not allowed to start these until I've finished at least two from the list above. I also have two quilt tops that have been UFOs for over ten years. I'm hoping to share these with you one day but as I'm planning on hand quilting then (they're hand pieced) there's plenty of time for that! As an extra incentive to finish it before the end of June I'm going to link up to A Lovely Year of Finishes for the first time and making Cadi's quilt my June goal! 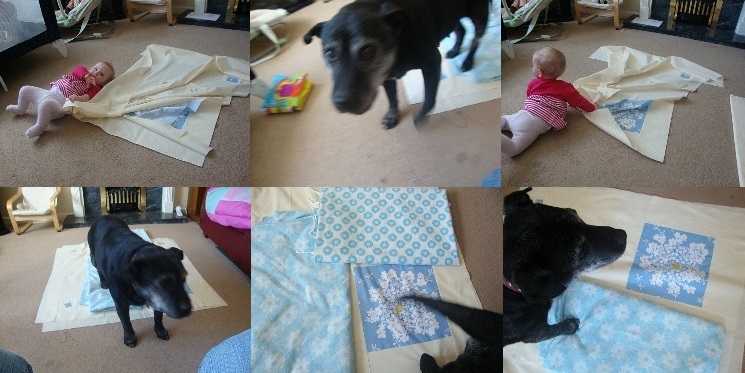 And because a blog post from me isn't complete without a family snap an explanation of the crinkly quilt top above.